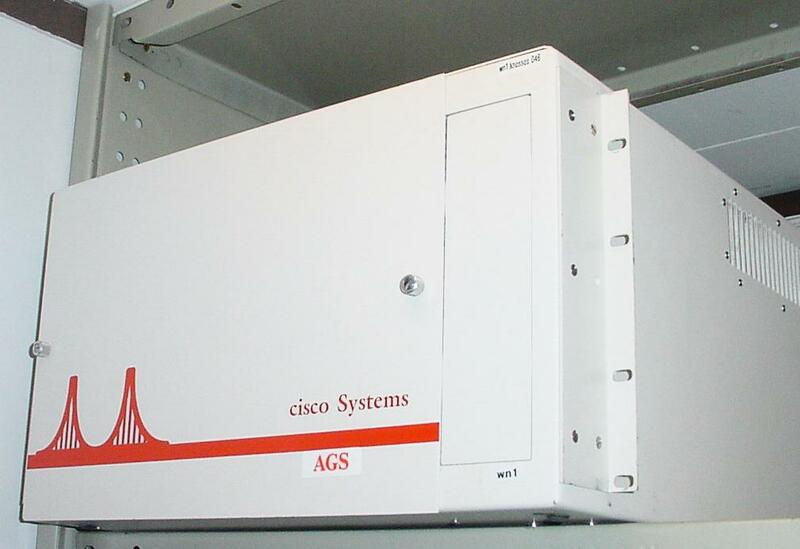 Originally, as the label implies, this unit had a CSC/2 processor card with a 68020 processor and 1MB of memory, and two 2E dual-ethernet line cards. The router was installed as the CSC router in the Old Kirk machine room, where it served the machine room and surrounds, and with the addition of a 4-port serial card (CSC-4S), connected the Kawaihiko network links to the University of Waikato (48 kbps), Massey University (48 kbps) and a backup link to the University of Canterbury (9600 bps). At this stage, the total Internet bandwidth out of the country (landing at Waikato University) was 14.4 kbps, upgraded to 64 kbps in 1991. The router was moved to the new CSC machine room in the Cotton Building in late 1991. In February 1993, the CSC router was “upgraded”. The upgrade, to an AGS+/4 involved a box swap — new chassis and CPU. The old AGS chassis sat unloved on the machine room floor. By October, however, the VUW Internetworking Group was starting to increase the number of synchronous leased line Internet connections it was handling, and also felt a need to physically split the commercial IP routing from the main campus network. It was noticed that a price change earlier in the year meant that the old price charged for the “upgrade” was the same as the new price for a fresh new AGS+ chassis, with no trade-in required. Cisco was called, and it was agreed that old chassis could be pressed back into service. So the first NZ Cisco was saved from landfill, and found new life as NZ’s the first large Internet access router. Cards were removed from the “new” CSC router and put back in the old chassis, giving it initially six serial and two ethernet interfaces, and Internet connections moved off the CSC router. The shiny new AGS+ was relegated to campus networking duties; the job of Internet uplink having already been moved to another smaller router as part of the TuiaNet upgrades. The router was upgraded throughout its life; the only original “MGS/2-4E” parts are the chassis and power supply, and the non-volatile memory card. The CPU card was replaced with a CSC-4 (68040, 16MB), to run IOS V10, and the system filled with CSC-2E2T and CSC-4S cards to give it 4 ethernet and 20 serial ports. It became known as wn1.netlink.net.nz, and provided the access point to some two dozen customers during the early phase of Internet services development. The router still works, and its NiCd non-volatile-memory batteries still hold a charge (although they don’t look very healthy). It boots into IOS V10, (from EPROM) and will even route traffic if asked nicely. Note that the “S” cards were only rated for serial operation up to 64 kbps. However, the speed of a synchronous line is usually determined by a clock on the communications device (DCE), not set by the terminal equipment (DTE), as is the case for most asynchronous serial ports such as those found on a PC. You could have a Cisco operating as the “DCE” to another DTE and therefore operate as the clock source, and if you did that, it would indeed only allow you to set the speed up to 64k. In the normal DTE mode it just did what it was told, all the way up to 2M and possibly beyond. Nevertheless, for commercial operations, it was considered good form to use the (rather more expensive) “T” cards for 2 Mbps operations. Rear view. The console and auxilliary async ports are at top left, below these are the four Ethernet ports (AUI interfaces, 10 Mbps). 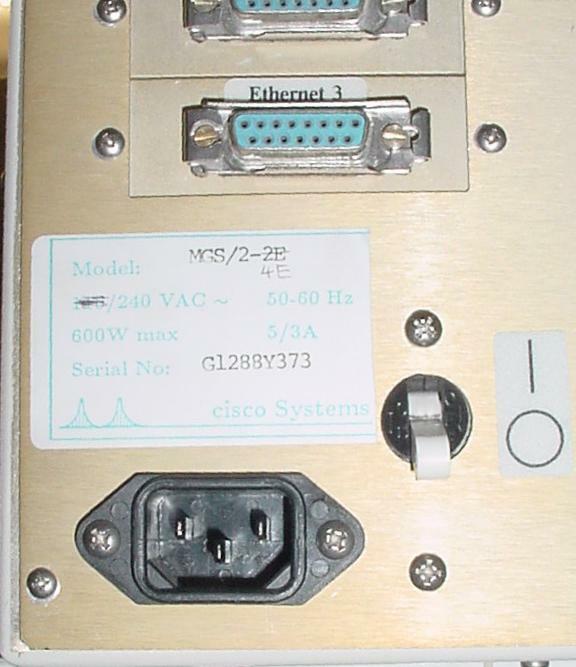 To the right of these are two high-density V.35 ports, connected to the CSC-2E2T card; these were used with G.703 modems for 2Mbps connections. 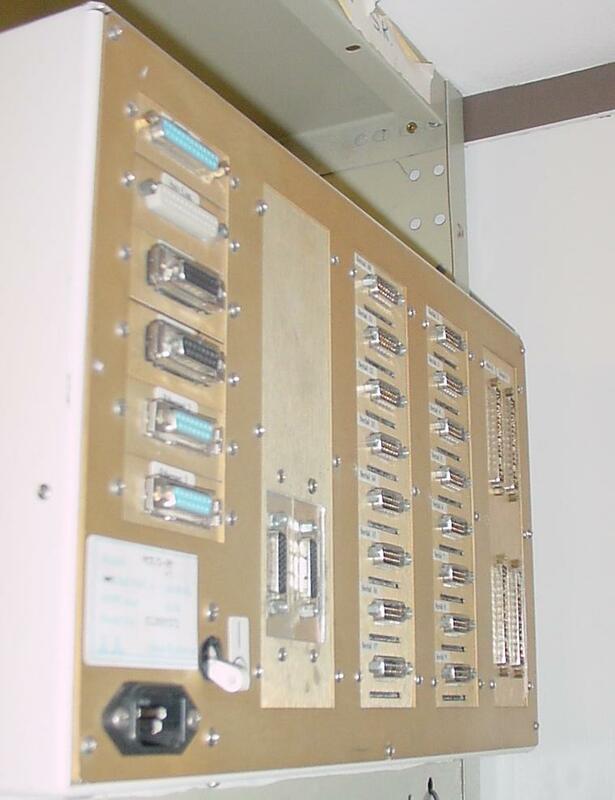 16 X.21 ports were used with low-speed DDS circuits (48k, 64k). The large connectors on the far right are RS449 connectors; only two are connected, and these had X.21 transition cables on them. 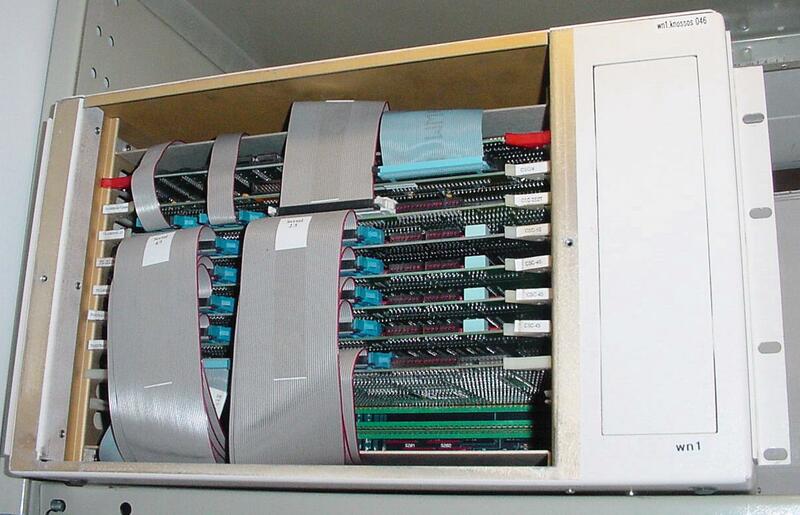 The large panel segment containing the two V.35 ports was originally a blanking plate, converted to carry two small applique panels (originally Ethernet, but the single V.35 appliques came in the same form factor) in the VUW CSC workshop. The manufacturer’s sticker on the back, with the name “MGS/2-4E” betraying its origins. 2) Do you have pictures of the CPU board? I’m doing some research on some early Cisco equipment (for restorations) and could greatly use some images of the CPU board (front and back). If you are thinking of parting with any of this, please let me know.